Although lawmakers from both sides of the aisle have expressed strong support for the National Science Foundation in the face of the 11 percent proposed cut for fiscal year 2018, agency leaders may face tough choices even if Congress provides significantly more than the request. Discussion at the June meeting of the advisory committee for NSF’s Mathematical and Physical Sciences (MPS) Directorate revealed that a topic high on the mind of agency leaders is how aggressively to pursue its 10 big ideas for future investment in fiscal year 2018 and beyond given the current budget climate. 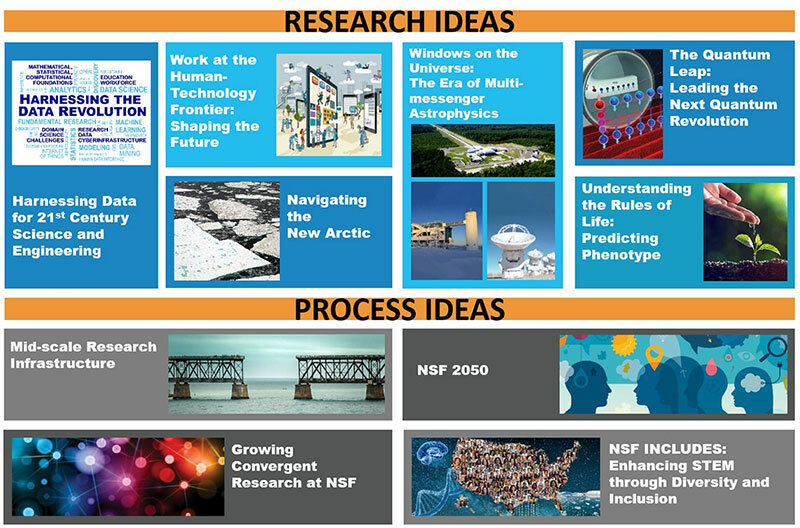 NSF uses this graphic to illustrate the 10 big ideas. Jim Ulvestad, acting head of the MPS Directorate, described the process NSF used to develop the fiscal year 2018 request. The overarching prioritization principles NSF leadership settled on are: continue to fund all science and engineering disciplines, support early career researchers and cross disciplinary programs, protect “core” research, roll back “accretions” (programs scaled up substantially since 2008), and make “strategic and prioritized reductions” within directorates. Ulvestad explained that NSF used a bottom-up approach to make decisions on cuts, giving each directorate given control over how to propose implementing them. He also said that NSF received no prioritization instructions from the Trump transition team. NSF remains firmly committed to the Big Ideas, which are at different levels of readiness. The FY 2018 Budget Request to Congress details a variety of activities related to the Big Ideas that (1) continue the investment in developing the research foundations, including piloting select new programs; (2) invest in building capacity in the research community; and (3) invest in the community-wide visioning and planning that will be crucial for effective implementation in the future. There are no funding totals attributed to the ideas in the budget request, with the notable exception of the INCLUDES program, NSF’s new initiative to broaden participation of underrepresented groups in STEM careers. NSF requests just under $15 million for the program, a 6.5 percent increase over the fiscal year 2016 level. However, the document provides examples of how each of the ideas shaped the agencies’ decisions. The Laser Interferometer Gravitational-Wave Observatory (LIGO), now famous for its detection of gravitational waves last year and a frontrunner for this year’s Nobel Prize, is an example of a facility closely tied to the Windows on the Universe idea, which touts the emerging era of “multi-messenger” astrophysics. The budget spares LIGO from cuts, requesting $39.4 million for the facility, equal to the amount provided in fiscal year 2016. One strategy is just to restore at some level some of the programs that we’ve reduced in the request. Another strategy is just to say, ‘well we’ve already made the tough decision to reduce those programs, let’s take that money and instead throw it into one of the big ideas.’ And we have discussed that tradeoff within the directorate at a fair amount of length. … [The discussion] is primarily driven from inside, but with the recognition of what the community has told us their priorities are on the outside. Ulvestad also noted that at a retreat the following week, agency leaders would discuss whether or not the big ideas would be a “major part” of the fiscal year 2019 budget request. During their discussion with Córdova, the advisory committee asked for her view on how “proactive” NSF should be in pursuing the big ideas in the current budget climate. Córdova noted her deep personal involvement in the program and her conviction of its importance. “If we don’t move the needle here, we’re not going to be the nation that we want to be,” she said. The advisory committee also expressed its general support for NSF making the tough decisions required to free up resources for new initiatives. In response, Córdova highlighted the array of factors that make it difficult for NSF to divest from facilities. She emphasized that the “broader impacts” criterion NSF uses when making funding decisions leads the agency to make different choices than if it only used its “intellectual merit” criterion. She gave the example of how several facilities NSF is reducing support for, including the Arecibo and Green Bank Observatories, are in regions that are part of the EPSCoR program, which aims to increase the research competitiveness of states or territories that garner significantly less federal R&D funding than others.